I never really intended to make another full map for Q3. I love the Doom 3 engine, and especially Quake 4, but that game is pretty much dead. Quake Wars is fantastic, fun and super-good looking, but at the time of writing the development tools have not been released. So....the assets I had been making for a Q4 level needed a new home, hence my return to Q3 level design. 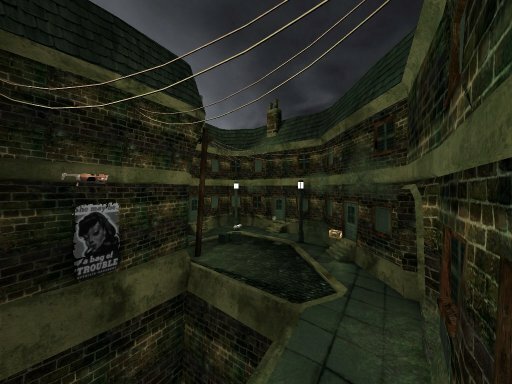 The premise for this map was to build a level that as far as possible with in the constraints of the game engine was free from alignment to the grid. Most levels are axial and blocky. Geometry aligned at 90 or 45 degrees. The real world is never like that. Brick work subsides, beams sag, corners become worn and smooth. With this in mind I decided to more or less abandon mapping in Radiant and instead make a series of models that could then be imported into the editor and put together as a complete level. The down side of this approach was the extra work involved, but the resulting map managed to achieve the fluidity that I was seeking. In addition to aesthetics, game performance is maintained. R_speeds are pretty good throughout. Because of the connectivity of the level there are one or two places where a little too much is being drawn, but over all vis is controlled well.